Emily is an artist studying at The Manchester School of Art. 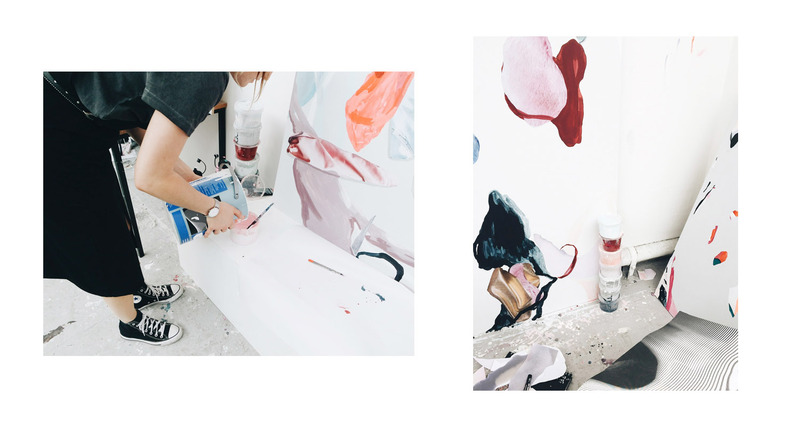 She works with paints and collages with inspirations such as fashion and texture. I walked into the Art studios in Uni the other week and was greeted by a bright room full of paint and artwork, I instantly felt inspired. I’d see glimpses of Emily’s work before but not up close and personal like this. I just had to share it with you all, here’s an interview talking about her practice and how she felt studying Fine Art. 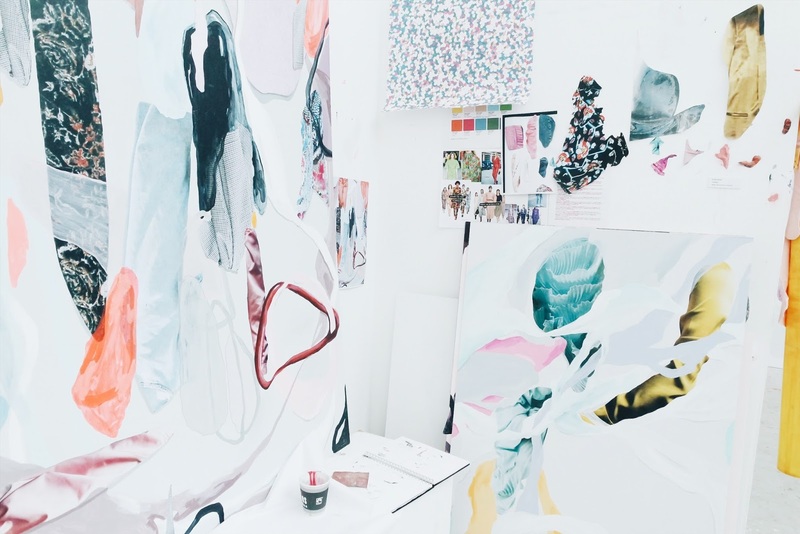 Your workspace looks accidentally beautiful, is that intentional? 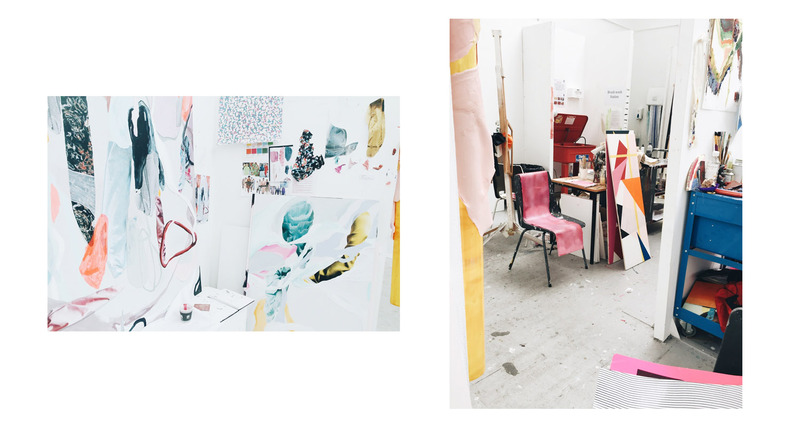 I love the Art studios at Uni; do you enjoy working in a Studio with others? It’s not intentional, I always think my space looks really messy and cluttered, but I suppose it’s cluttered with the things which spark ideas for new work. I definitely like working among others, the atmosphere is always really upbeat and we try and help each other out by having discussions about our work on a daily basis. Who are your main inspirations right now? Where would your ideal location to live and work be? Do you feel that location affects your Art? Somewhere hot, for sure. Maybe somewhere on the West Coast of America, like LA, where there’s big blue skies and palm trees and lots of mid-century modern architecture. If you didn't study Fine Art what would you be doing? I originally set out to study Catering because I desperately wanted to be a patisserie chef. Sometimes I regret not pursuing that but I was put off by the unsociable hours and the idea of getting bossed about in a kitchen when all I wanted to do was bake cakes. If I could go back now I would definitely be more conscious about my choice of course, throughout the three years I’ve gradually regretted not doing something more fashion based, maybe in marketing as that is a career I am now hoping to pursue after Uni. Do you feel that coming to Uni has helped better your practice or are you indifferent? Would you recommend Higher Education to someone considering it? At school, the way in which we were taught art and the type of work we produced was very traditional, so by the time I had left I was making very detailed portraits. I then took this kind of practice with me to college where, for the first time, it was rejected and instead I was pressured to work with mixed media, I remember at one point I was smashing up stones and using them in a painting and thinking this isn’t me. Now I’m about to finish Uni, I do look at my work and think it’s a lot different to anything I’d have ever imagined myself making. However, my practice has come on a real journey since the small collages I was making in first year and I am so pleased with the end result. What piece of advice would you give to someone coming to Uni to study Fine Art? Do your research, what is the course offering you. When I accepted my place at Manchester I wasn’t aware that the course was going to be so self-directed and although a super flexible timetable and independent learning works for some people, I just expected more teaching. Absolutely, I am constantly inspired by fashion campaigns, like those of Gucci and Prada. 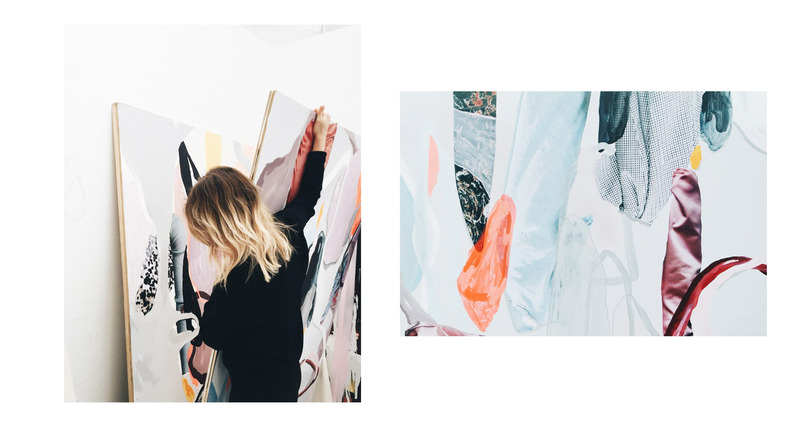 All of my imagery within my work is sourced from fashion magazines which I cut out and enlarge appropriately for each painting. I try and keep really up to date with the colour schemes which are prominent within a trend or those forecasted for future seasons in order to make sure each piece can be perceived as ‘trendy’ as possible. Along with magazines, in the past I have obtained poster material from the visual merchandise from stores like Topshop and Urban Outfitters. If you could collaborate with one person/brand who would it be? I am obsessed with the apparel company Ban.dō for their fun colour schemes and celebration of everything female. So it’d my dream to collaborate with them and see my collages in their agendas with the words ‘girl gang’ emblazoned across the page.